Newcastle Fans Cheering On Sunderland? I’ve never cheered on Sunderland and never will, at least not until the day when on the last match of the season we need them to beat somebody to help us win the Title…anyway, back to reality. I’d rather that the mackems had got stuffed last night but the fact they beat Reading might not be the worst thing in the world in our current predicament. Yes it means they came out of the bottom three and meant that we are only two points away from the relegation zone but if we ever are looking and worrying about their results then you know we’re in trouble. Newcastle’s season rises or falls on what our players do, not anybody else’s. I think we’ll end up ok in terms of Premier League status but I think we do need every bit of pressure put on Mike Ashley to invest in the essential players we need in January, obviously in terms of pressure I’m not talking about us all turning up with burning torches at St.James’ Park or scrawling misspelt messages on the sheets off your bed. I know that it is a bit of a comfort blanket for most of us if no matter how bad things get, Sunderland are still below us, but that is drifting into a mackem mentality. We don’t need the owner imagining he has that comfort blanket in any way. 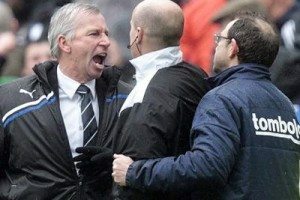 Mike Ashley and Derek Llambias need to appreciate that essential repair/improvement work is carried out that they failed to do in the summer has to happen in January, they basked in the reflective glory of Alan Pardew’s success last season and now is the time to show they back his judgement in the transfer market. Whatever happens, if the mackems temporarily creep ahead of Newcastle United then it could help give Mike Ashley the transfer market push he needed in the summer.